Does your business have an event coming up? Maybe you’ve had one in the past. Either way, listen up. Which marketing techniques have you tried using to promote the event? Did you spend beacoup $$ only for it to bomb? Before you rack up those dollars once again, STOP! We’re about to tell you how to maximize your event with completely free marketing! Let’s say it together: money does not equal results. So, where do you start? First thing’s first. You must have a branded campaign. Keeping things consistent is key. You want your event to have it’s own personality and temperature. If you do not currently work with a graphic designer, no worries. Many smaller companies do not have the available funds for outsourcing. To keep costs down for smaller projects, we like to use Canva. If you haven’t checked it out yet, click here to sign up today, it’s FREE! The site is easy to navigate and has preloaded design ideas. Now that you have your imaging locked and loaded, it’s time to plan. You’ll want to start promoting your event 1 to 2 months before. Create an event via Eventbrite. It’s free for organizers to use Eventbrite if you’re not charging for tickets! There are no monthly charges, enrollment costs, or setup fees. If you’re charging for ticket sales, the fees vary by package. One of our favorite features is that you can track your analytics. First, create an event on Facebook with the details. Remember how we talked about branding the event? Be sure to use an image that pertains to the event as the cover image with little to no verbiage. Save all the verbiage for your event details and posts. Encourage your team to share the event in their feeds for initial exposure, then plan your posts about the event on your feeds. Don’t forget to post inside the event, too! If you’re schedulers like us, Facebook allows you to schedule posts inside the event page. When you post in the page, this allows for any individual who has marked their response as either “going” or “interested” to see the post. Use these posts wisely…do not spam your followers. Be informative yet engaging. We suggest aiming for two posts per week. If you have an Instagram page, you’re in luck. Instagram is EXPLODING with activity these days. Instagram is the perfect way to get a point across with little to no verbiage. Since there are no current options for promoting events on Instagram other than to boost a post, we must take a different approach. The first action is to change your bio. If you’re selling tickets, you have the option to change a tab to “Get Tickets” and add the Eventbrite link. If you are not selling tickets, you can change you bio to direct your followers to a website with more information. 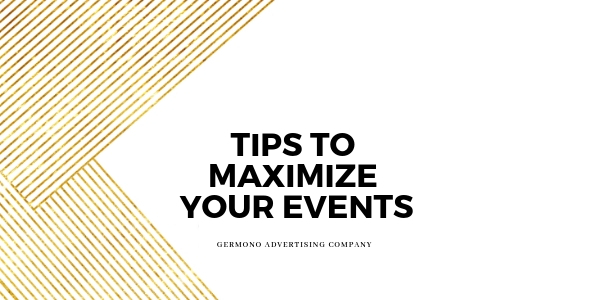 Like Facebook, you want to interrupt your normal feeds with two to three posts per week about your event using the imaging you have created or organic photos that pertain to the event. We like to add “Instagrammable” photos that grab attention: a smiling female, a crisp clear photo, an engaging video, etc.. Don’t forget to be engaging with your captions. Instagram Stories is a huge plus! Many Instagram users are still unfamiliar with the process. However, once you get familiar, you’ll notice the endless possibilities. Unlike Instagram feeds, posting multiple times on your story is not discouraged. The more active you are, the more chances you have for exposure. Use stories daily to post videos and images talking about the event. You’ll need handy-dandy Google for this search. Local newspapers, radio and tv stations offer event calendars where you can submit your event, free of charge. You can also check your city or region’s website for opportunity as well. Plan to start posting about the event 1-2 months prior. Post on all platforms 2-3 x’s a week leading up to the event. Change Instagram bio to direct traffic. Search local calendars for submission opportunities.